Here are three critical areas that today’s “transformer” CIO needs to address to foster an agile digital marketing strategy and catapult ahead of the competition. Just as Captain Kirk and Spock ventured to new worlds and made tough decisions to steer the Enterprise to safe ground, sales executives also have to make the right decisions to drive their organizations to hit their sales targets. Here’s some interesting examples of companies using virtual reality as a marketing tool. Take our 2 minute marketing tech survey and be entered to win a $200 AmEx gift card. Not all marketing-related technologies are equally important, nor are they always necessary. Getting the best right information out of your CRM system can improve your marketing mix across all channels. 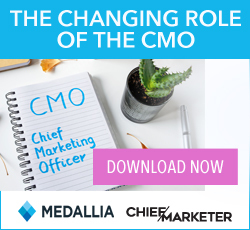 CMOs and CIOs will need to work more closely together than ever before as marketing technology solutions have become critical to success in many organizations.